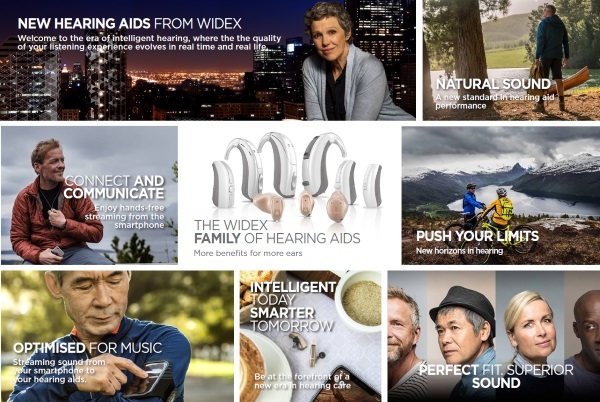 Widex is one of the world's leading companies within digital hearing aid technology. Today, our hearing aids are sold in more than 90 markets around the world, with 97% of our output exported from Denmark. With a world market share of approximately 10%, we are the world's sixth largest manufacturer of hearing aids. Our hearing aids help people with hearing loss to communicate better - something which is of immense importance to their quality of life. We also place great emphasis on the area of children and young people with hearing loss, as early intervention is important for their language development. Widex is based on know-how, as represented by our innovative staff and five decades of intensive technological research and development. We develop digital technology at a level of quality that few can match, and which has made us one of the most innovative manufacturers in the industry. In 1995 Widex became world-famous when it introduced the world's first digital in-the-ear hearing aid, and the pace of progress has been swift since then. With our latest top-of-the-line product, Inteo, Widex is setting entirely new standards and charting new possibilities within hearing aid technology - all with the aim of improving the quality of life of people with hearing loss. WIDEX UNIQUE: the new hearing aid series which takes digital processing to a new level to capture more sound than any other hearing aid on the market. COM-DEX: a new stylish, hands-free communication accessory that streams high-quality sound from mobile phones to hearing aids. FASHION POWER: a new power BTE designed to provide powerful audibility without compromising sound. WIDEX EASYWEAR: a unique wire and receiver ear-tip solution for RIC/RITE hearing aids. DREAM CIC MICRO: an ultra-small Completely-in-canal (CIC) hearing aid for the ultimate in discretion. UNI-DEX: a new neck-worn and hands-free device that streams audio from mobile phones (or any audio device) to user’s hearing aids. WIDEX DREAM: A new family of hearing aids with the absolute latest in advanced hearing aid technology. DREAM sets nothing less than a new standard in hearing aid performance. ZEN2GO: A new tinnitus management device that plays random, soothing harmonic tones called ZEN. IIC: The ultimate invisible in canal hearing aid with no joined parts or hard edges - a truly invisible solution. WIDEX SUPER: World's first receiver-in-the-ear (RITE) super power hearing aid. WIDEX BABY440: World’s first hearing aid designed specifically for babies. CLEAR440: Widex’ first completely wireless hearing aid. WidexLink: Proprietary wireless technology designed specifically for hearing aids. DEX assistive listening devices: A range of wireless accessories that connect hearing aids to mobile phones, televisions and audio, remote controls and landline phones. Passion: World’s smallest RIC hearing aid - only 21 mm in diameter. mind440: The first hearing aid with the revolutionary ZEN tones that help users relax and have been proven to help in managing the effects of tinnitus. NanoCare: a unique, Widex patented wax guard system based on nano technology which enhances the performance of hearing aids and increases their lifecycle. Inteo: World’s first hearing aid giving a tailor-made sound experience. Senso series: World’s first fully digital in-the-ear hearing aid – no less than a revolution. In 2005, CNN lists modern, digital hearing aids as one of the top 25 innovations of the past 25 years. CAMISHA: (Computer Aided Manufacturing of Individual Shells for Hearing Aids): a groundbreaking, Widex-patented technology based on computer modelling and laser technology. CAMISHA transforms the way shells, earmoulds and earpieces are made across the entire industry. Quattro Q8: First digitally programmable hearing aid with remote control. Widex was founded in 1956 by the Tøpholm and Westermann families, who still own and run the company. Widex now employs around 1,850 staff around the world, of whom 900 work in Denmark. Our head office is located in Lynge, Denmark, which is where our research, development and administration is based, as well as most of our production. Widex also has large assembly departments in Helsinge in North Sealand and in Verviers, Belgium.